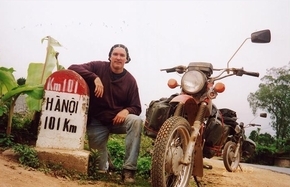 I just wanted to say how much I enjoyed the trip to northern Vietnam last March. Even though it was only a four day trip, the itinerary put together allowed me to see more than I anticipated. My guide was very professional and great company. I was very interested to learn about the country and way of life, and he was a wealth of knowledge. Visiting in March (rice planting time) allowed me to get some great pictures. I particularly enjoyed my stay with the Thai hilltribe family near Mai Chau. The food was great and the beer in the plastic bottles went down smooth after a day of riding. The concoction of sugar cane juice, lime and rum (with Ice!) wasn't too bad either. The best of the trip was the 3rd day traveling through the valley between Gai Phu and Phu Yen. I had to double back there early the next morning and take more pictures. The Minsk motorbike was a workhorse that made it through the trip. Only need a few extra spark plugs and some duct tape to fix them. The saddle bags were more than enough room to handle my needs. The lasting memory is the unbelievably beautiful scenery and the friendly people. I always felt safe and was surprised at how welcome they made westerners feel. I am hoping to return there in a couple of years. Next visit will be a longer trip up to the far north (China border). See you then (I'll bring more duct tape).